Yesterday, I posted a video to my Instagram sharing part of the toffee process. How about an easy to read recipe, too? I found this in an old church cook book and have used it for years. I’ve since since similar recipes all over. It’s super easy to make an absolutely delicious. Line a cookie sheet or jelly roll pan with parchment paper or a silicone baking mat. Sprinkle 1/2 cup of chopped pecan over pan. Mix remaining pecans with chocolate chips. Set aside. Cook butter & sugar over medium high heat until 300°F, stirring constantly. Pour hot candy over pecans. Sprinkle chocolate chips & pecans on top of hot toffee. Let sit a few minutes and then spread melted chips with a spatula. Allow to cool to room temperature. Refrigerate approximately an hour to firm up chocolate. Break into bite sized pieces and store at room temperature. Now through December 31, everything in my Etsy shop, patterns, magazines & original handmade items, are 20% off your total order over $6.99! Just enter coupon code HAPPYDECEMBER when you check out to receive your discount. 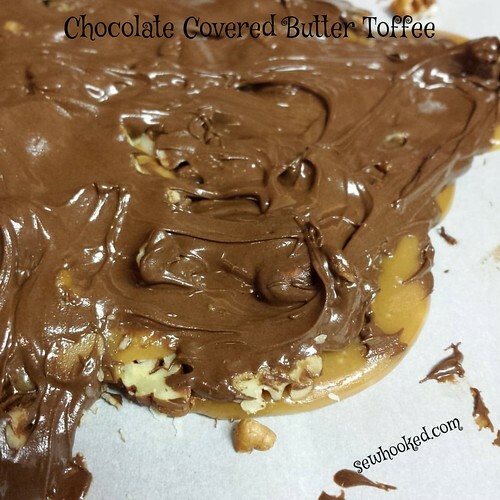 This entry was posted in recipe and tagged butter toffee, chocolate covered butter toffee, recipe on December 17, 2015 by Jennifer Ofenstein. Yummy! I make this every year for the holidays but with sliced almonds.